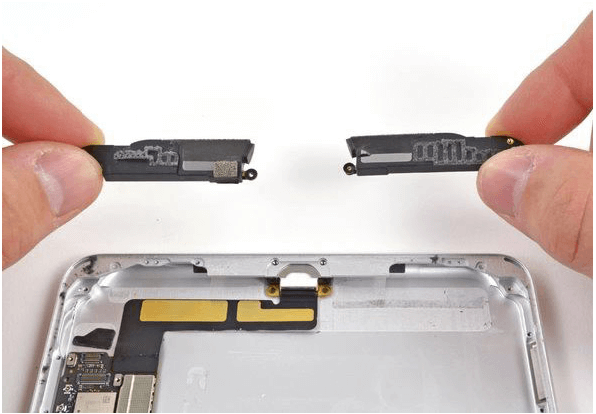 Self disassembly of the iPad Mini tablet. The subtleties of the process. Any technique is short-lived, even the vaunted Apple iPad Mini. 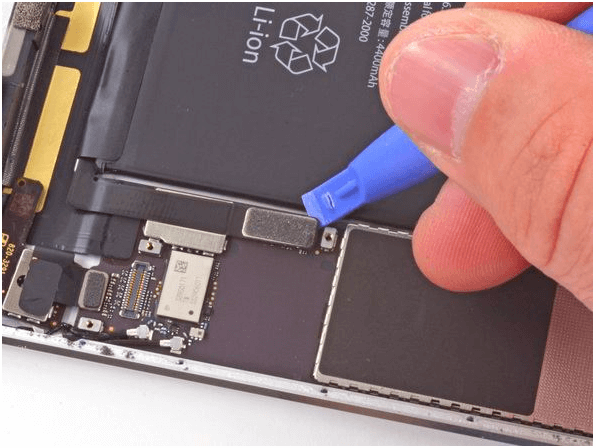 No one says that it is constantly breaking down, but the negligence of users, or careless use, periodically forces to “open” the device in order to replace this or that module. 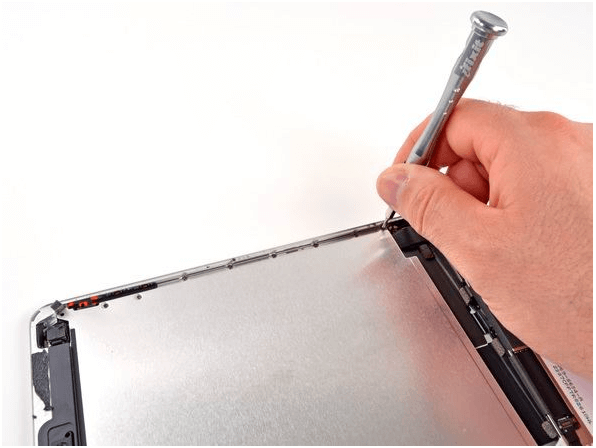 If you think that carrying a tablet in service is stupid, and decided to repair the device yourself, use our instructions. 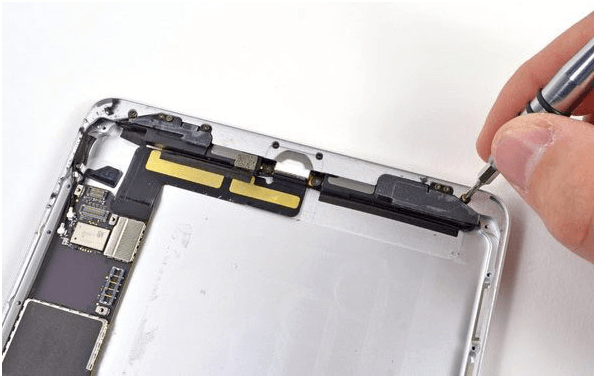 We pick up our iPad Mini and see that the back cover is not removed, and the bolts are not visible anywhere. Let's start with the fact that the design used glue. To do this, take a hair dryer and begin to gently "blow" on the entire front area of ​​the screen. As soon as you feel that the display has started to fidget, gently pry the frame with a pick / card, as in the screenshot. Leisurely spend the tip of the card around the perimeter of the front. If you have rested against something - do not jerk. 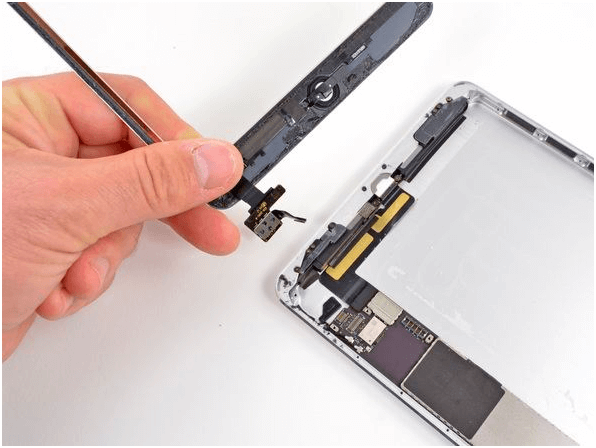 As soon as the frame of the iPad Mini is dismantled, we proceed to removing the display itself. It is mounted on 16 screws, hidden by plugs, like this one. Did you do it? Go ahead. Gently lift the matrix, but not with a jerk, because it is attached to the board with a cable. You can remove the iPad Mini display if you get rid of the metal plate. If a piece of metal is still defeated, you can congratulate yourself. Now the disassembly process will be much faster.. 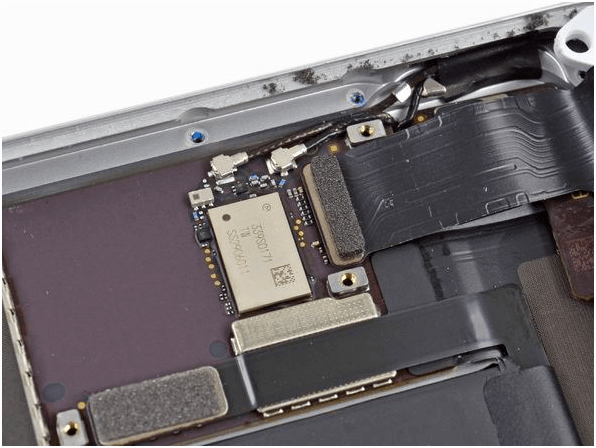 Under the sheet of metal, “hides” not only the sensor cable, but also part of the iPad Mini's motherboard, as well as a Wi-Fi module with a set of letters in the name. Carefully unscrew all the bolts around the perimeter. Mobile contacts are quite fragile. We reach the coveted display loop, which is hooked by the same pick or stack. But the cunning Cupertins prepared another “trap” in the form of a couple of pieces of electrical tape. Gently peel them off with tweezers. 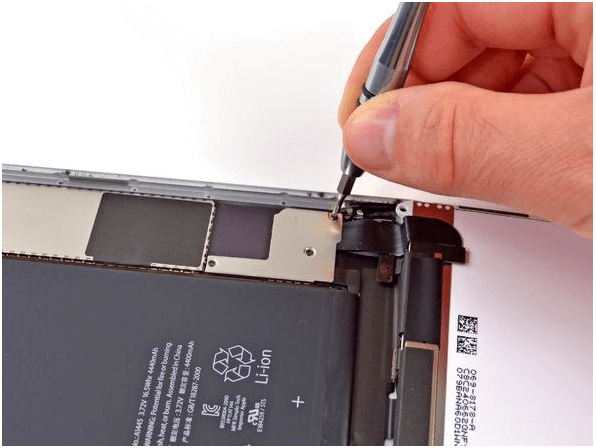 Now the screen of the iPad Mini with a clear conscience can be put aside..
We reach the battery, which is mounted on the same adhesive tape. The procedure for peeling off is similar to screen manipulations. Do not forget to disconnect the cable with the contact. 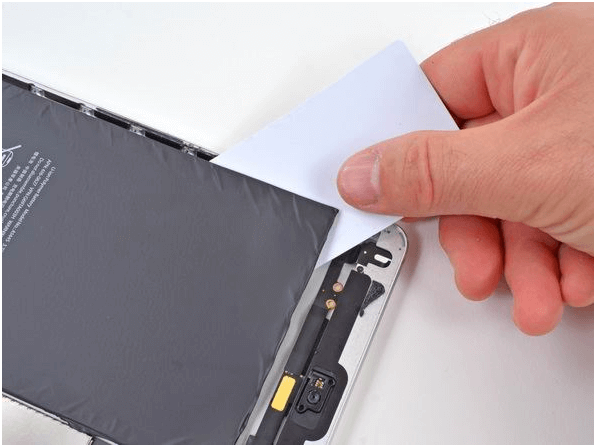 The battery is hooked up with a plastic card around the perimeter, after which it is removed. So, we get to the key components. Below is a Wi-Fi and Bluetooth antenna, mounted near the speakers. There is also a touch panel. Separately, you can’t remove the Lightning connector - this is part of the motherboard. Do not damage this connector! Otherwise, it will have to be changed along with the board! Only the “mother” remains. Pre-remove all the bolts and re-"arm" a hair dryer. Without it, it is impossible to remove the board Carefully but gently warm the rear cover until the coveted motherboard is peeled off. Fine! 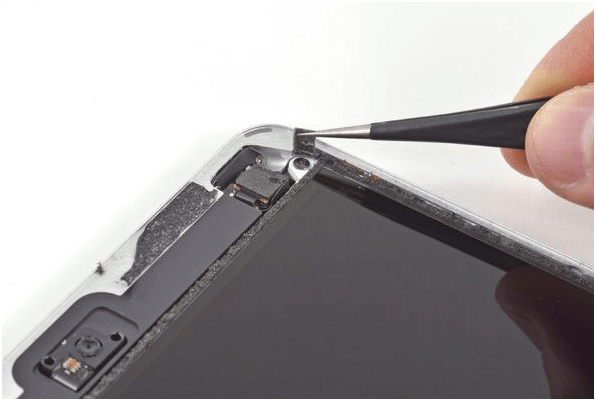 Now you know how to disassemble the iPad. Appsgames⟾Miscellaneous⟾Self disassembly of the iPad Mini tablet. The subtleties of the process.